Chunky cardigan is fall's best transition sweater - Susan Said... WHAT?! Weekend tailgating parties are a sure sign that fall is finally here. But, dressing for fall’s best outdoor events can be tricky for me. In the early morning, the thermometer may hover at 50 degrees, by mid-afternoon top 75, then plummet again in the evening. My favorite solution? A chunky cardigan. Toss a trendy long cardigan over denim shorts and a tank in the morning, and as the day heats up, simply remove. Or, pair one with jeans and a body-con tee or a casual shirt dress. A cardigan eases your summer wardrobe into fall and keeps your toasty warm on a chilly fall evening! The casual cable knit sweater from Simplee Apparel, pictured, is my ultimate fall transitional cardigan. The lovely all-over cable design is a classic. And, I adore the new, long style because, not only does it have a great relaxed look, it’s so darned flattering for all body shapes. It is even designed with big patch pockets (perfect for cell phone, keys, sunglasses, and more) for handbag-free fall fun. This sweater is made of 100% acrylic. So, it can easily be washed in the machine on cold and dried flat. It has some stretch to it, so it’s a smart solution for travel, since it does not wrinkle when packed or when worn on long car trips. Unfortunately, this cardigan sweater is only available in “one-size-fits-most.” But, it should fit most women with US sizing 0-10. This chunky cardigan is available in three great shades. I chose the Loden Green, as shown (my new fall color obsession!). But, it is also available in a deep, rich burgundy and a light purple/lavender. Retail: $27.99. For more must-have fall looks, such as pullover sweaters, batwing sweaters, ponchos, oversized and one-shouldered sweaters and more, visit Simplee Apparel. DISCLAIMER: No financial compensation was received in exchange for this post. 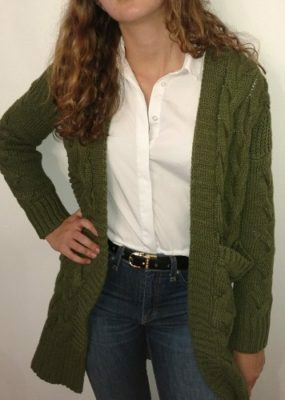 I did, however, receive a sample of the Simplee Apparel chunky cardigan sweater in order to fully test the product and provide an honest review. Regardless, I only recommend products or services that I believe will be good for my readers.